Stunning and completely custom, this large 4 bedroom, 4 bathroom is one of the most desirable residences to come to market at 100 Barclay Street. Facing north and west with river and city views, this apartment is bathed in light and impeccably renovated including all the latest in technology and style. The desirable layout, reminiscent of an uptown apartment combined with downtown loft-like features including 10 ceilings and large 7 high casement windows, making this an ideal home for the discerning buyer. An elegant entry hall leads to the sprawling living and dining room which encompasses the northwest corner of the building. 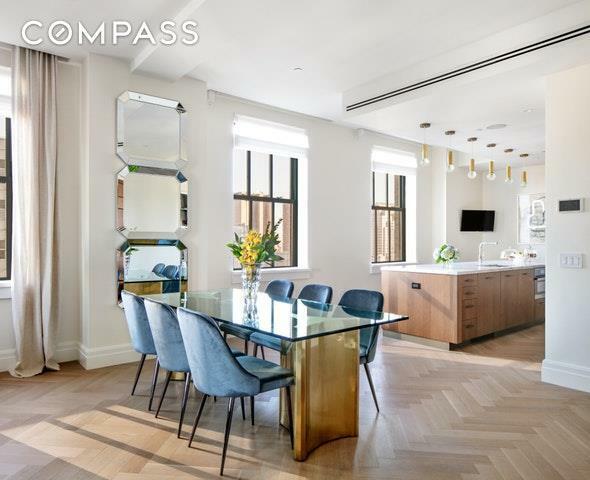 The high ceilings, large windows and white oak herringbone floors create a feeling of space, light and elegance that is ideal for everyday living and entertaining. No expense was spared in the upgrades throughout the home, including a Crestron system which controls lighting, motorized shades and a fully integrated sound system throughout. 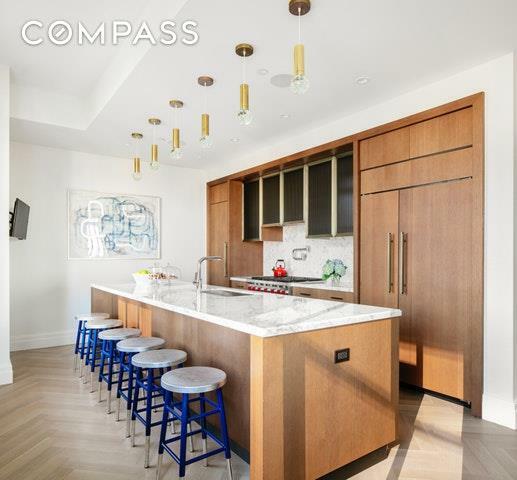 The large, open windowed kitchen features custom cabinetry and hardware with Calacatta gold marble countertops and backsplash, including a huge island with a breakfast bar. The kitchen outfitted with high-end appliances include a Sub-Zero refrigerator, Wolf range and Miele dishwasher and microwave, as well as a garbage disposal and vented range hood. The hall bathroom was completely renovated in an art deco style with a mirrored glass shower, bronze fixtures and rich accent wallpaper. The master suite is large and comfortable facing west with Hudson River views, a spacious walk in closet that has been completely built out along with three secondary closets and also features a private secondary entrance into the apartment. The master bath has radiant floor heating, polished Calacatta gold marble floor and wall tiles, a custom vanity, fixtures and a deck-mounted tub by Waterworks, and steam shower. The three secondary bedrooms are all large with ample closet space. 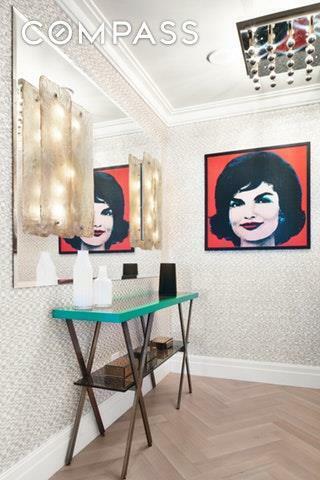 Two bedrooms feature en-suite bathrooms, each with their own distinct style. The laundry room off the main hallway has a large washer and vented dryer along with storage cabinets and sink. The apartment also comes with a large storage room. 100 Barclay is the premiere pre-war condo conversion in Tribeca occupying the Ralph Walker designed building dating back to 1927. 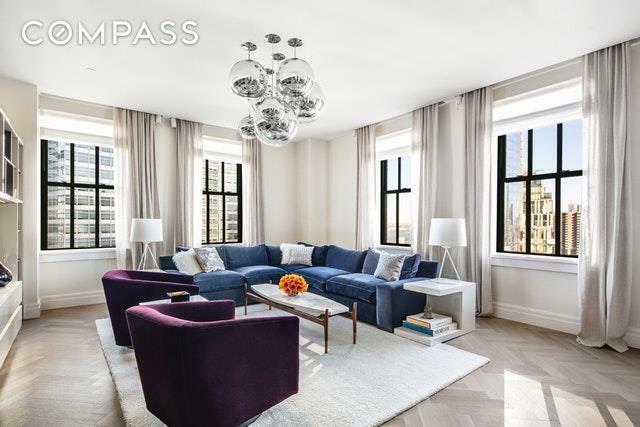 This luxury condo features a 24-hour doorman, concierge, and valet parking. The building includes extensive amenities with over 40,000 square feet of space, including a fitness center run by The Wright Fit, an 82-foot heated lap pool, a billiards room, a club lounge with bar and dining room, four common outdoor spaces with sunrise and sunset terraces, children's play room, teen lounge, media lounge, wine tasting room, conference room with Wi-Fi throughout club level, private recreation space, and bike storage.